By now it’s unlikely that our readers don’t know what Hillary Clinton said in an interview with CNN’s Christiane Amanpour earlier this week, namely that it’s impossible to be civil with the Republican Party, and that civility can return when her party takes power on Capitol Hill. “When you’re dealing with an ideological party that is driven by the lust for power, that is funded by corporate interests who want a government that does its bidding, you can be civil but you can’t overcome what they intend to do unless you win elections,” she told Amanpour. Scalise, obviously, has complete standing to protest Clinton’s abandoning of civility seeing as though an unhinged leftist loon almost killed him in a shooting at the Republican congressional baseball team’s practice session last June. But while Cassidy hasn’t been physically attacked he’s one of the more common victims of left-wing nuts accosting him in a threatening fashion, be it at town halls, in the Senate’s hallways or even online. These two have seen the decline in civility and sanity in political life, and to them it has to be unnerving to see Clinton – in an interview done from Oxford, England, of all places, so she wasn’t even in the country while exhorting her supporters to get “tougher” – essentially abandon civilized political debate. Cassidy in particular had it right. It’s an irresponsible statement, and one the Democrats ought to be running from at top speed. Except they aren’t. If anything, Clinton captured the mood of the American Left, which in the wake of the Kavanaugh confirmation now appears to be committed to even more unhinged and insane street theater. We can’t help but think this is going to get worse before it gets better. And we join Sen. Rand Paul, who worried earlier this week that somebody would get assassinated if this current political climate persists. What’s most frightening is the fact that so much of the Democrat Party’s top leadership thinks this climate is a good thing – they clearly think whipping the Hard Left into its current frenzy will help voter turnout. But if they’re wrong and they don’t manage to win anything of significance in the midterm elections, then what? People who have their cars set on fire because a Trump sticker is on the bumper, or who get attacked for going to a political rally, or who get drinks poured on them at restaurants because they’re wearing a MAGA hat, are not just going to sit still and take it forever. At some point they’ll respond. And when they do, the current climate will turn into something far worse. It would be nice if people on both sides recognized this. So far, that isn’t the case. 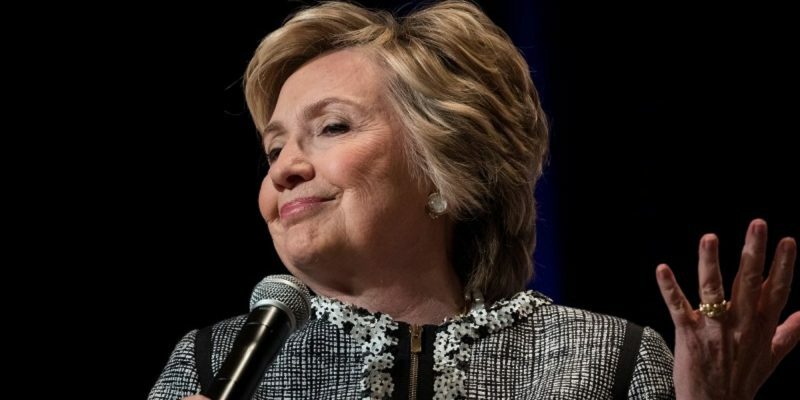 One final thought to close this out – do you think Clinton’s newly heated rhetoric is just driven by butthurt about Kavanaugh, or is it something else? We can’t help but think that if the midterms go badly for the Democrats Trump could decide to let his own dogs loose – and one manifestation of that could be the Justice Department engaging in a full-on investigation of the Clinton e-mail case and the Clinton Foundation, not to mention the potential money laundering operation her 2016 campaign was. Could it be that Hillary is using this overheated combative language in an effort to set a predicate for the legal troubles which might be over the horizon, and set up the accusation that those troubles to come are mere political recriminations rather than the accountability for illegal behavior which would be inevitable to anyone else?